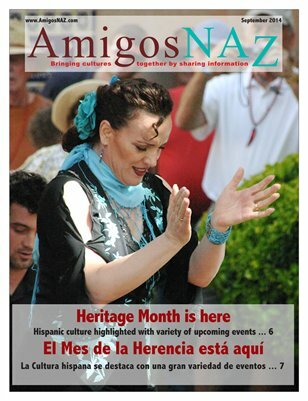 The September 2014 edition of AmigosNAZ opens with a cover story on the growing number of cultural events taking place around Hispanic Heritage Month in Northern Arizona, from the 2014 Grand Canyon Salsa Festival in Flagstaff and the Flagstaff First Friday Art Walk event at Our Lady of Guadalupe Catholic Church & Cultural Center to Hispanic independence celebrations in Sedona and Flagstaff. The edition also includes commentaries on the season of nutritional health for both students and families, a report on the growth of the Hispanic student population at Northern Arizona University, the publication of a book in Spanish on the Spanish-American War, an opportunity for youth to get free tours of Flagstaff-area national monuments and a report on the growing number of fraudulent requests for money or personal information in the region. All this and more brought to you by AmigosNAZ — Providing information for and about the vibrant Latino community in Northern Arizona.